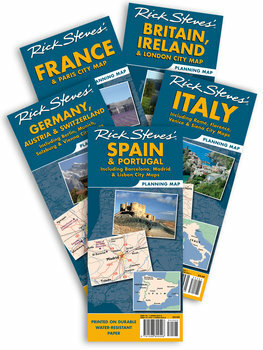 Great Deal: Get all five Rick Steves regional maps (Italy, France, Britain-Ireland, Germany-Austria-Switzerland, and Spain-Portugal) for the price of three! Italy Planning Map: Tutta l'Italia, from the Alpe di Siusi to Sicily, with three regional close-ups. The reverse side includes detailed city-center maps of Rome, Venice, and Florence, locating sights from Rick's guidebooks. France Planning Map: Beaucoup de France, from Calais to Corsica. The reverse side includes a detailed heart of Paris map, locating sights from Rick's guidebooks and a handy Paris Métro map, too! Britain & Ireland Planning Map: Both islands from top to bottom, with detailed city-center maps for Dublin, Edinburgh, York, and Bath, and a handy driving time/distance map. The reverse side includes a detailed heart of London map, locating sights from Rick's guidebooks, and a handy London Tube map, too! Germany, Austria & Switzerland Planning Map: The hills are alive, from the shore of the North Sea to the towering Alps. The reverse side includes detailed city-center maps of Berlin, Munich, Salzburg, and Vienna, locating sights from Rick's guidebooks. Spain-Portugal Planning Map: All of Iberia, from the Pyrenees peaks to the Algarve Coast. The reverse side includes detailed city-center maps of Barcelona, Madrid, Sevilla, Granada, Toledo, and Lisbon, locating sights from Rick's guidebooks.